This is the first post in a new climatetippingpoints.info series fact-checking claims that various climate tipping points have been crossed, and that sudden catastrophic warming is now inevitable. See the Introduction post for an overview. Some commentators (e.g. 1,2,3,4,5,6) have become worried that the first summer instance of an ice-free Arctic – what some have termed a “Blue Ocean Event” – will happen very soon, and will lead to a rapid increase in global warming and extreme weather through positive feedbacks that could even end in ‘runaway’ warming. In this first post of climatetippingpoint.info‘s new Fact-Check series, we investigate whether these claims add up. ASSI extent, IPCC AR4 projections vs. observations in 2008. The penultimate very low year is 2007. An ‘Ice-Free’ Arctic is defined as less than 1M sq. km. As used by XR Heading for Extinction talks without credit; original source is the 2009 Copenhagen Diagnosis report. Note that the observations are 11 years out of date, and ends just after the extreme low year in 2007 after which the trend has partly stabilised. The most recent IPCC projections of ASSI extent from a subset of models that best captured recent ASSI changes. A high (red) and very low emissions (blue) scenario are shown (shaded bands are model ranges, solid line the mean) against observations up to 2013 (yellow). This updates the previous figure shown. Note that most recent sea ice extent data is fairly close to the final 2013 value shown here, and so is currently tracking the model means. Under high emissions the Arctic might be ice-free by ~2040 (and likely by 2050), & under low emissions by ~2050 (and likely never). Source: USGS, & this version for the original IPCC figure with all models. Trends fitted to 1980-2017 PIOMAS September Minimum Arctic Ice Volume (N.B. not area like in the previous plots). Image taken from XR Heading for Extinction talks. Original source unclear, but probably from Paul Beckwith (e.g. his Blue Ocean Event post). Firstly, it’s worth noting first that this graph is using sea ice volume rather than sea ice area, on the basis that total volume is more linked to climate forcing than extent alone and is declining faster than area, and that thicker ice is more stable. But for feedbacks on climate change we’re mostly interested in extent, as it’s the visible area that reflects back solar energy, and an effectively ice-free Arctic is defined by an extent of less than 1 million square kilometres of sea ice. The graph above might look convincing enough at first. But one problem with fitting trends like this – and especially non-linear trends like the curved ones here – is that one or two especially low outlying points can drag the trend significantly down, but may well turn out to be anomalously bad years due to inter-year natural variability. In this case, 2007 and 2012 were especially bad years, where natural variability amplified rather than countered the long-term warming trend. This tendency is shown by how re-fitting these same trends on this up-to-date data delayed the date for an ice-free Arctic by ~5 years when compared with a previous version of this very same graph. And unlike the first ASSI extent graph shown earlier, this graph only uses data from 1997 for it’s straight line rather than the whole dataset, making the straight line fit far less well than the other lines using the whole dataset. But more importantly, fitted trends assume a predictable underlying pattern that is captured by the simple line you fit. But without understanding the actual underlying physical drivers of this pattern, they can give false confidence in projecting these trends in to the future. The extent of Arctic Sea Ice is affected by many factors beyond surface air temperature that make it more difficult to predict, including weather events, cloud patterns, and fluctuating ocean currents, none of which is captured by fitting a simple line. And although the ice-albedo effect is strong, its impact will decline as total ice extent declines. Once sea ice extent is low, a further drop in extent will have less of an impact on regional warming compared to when the extent was higher. As a result, we would expect the decline to begin to slow down once lower extents are reached, and so for the summer ice-free Arctic date to be delayed. This difficulty in predicting ASSI extent from year to year has led to many predictions of its total collapse that have not come to pass. Back in 2007 some thought that 2013 would first see an ice-free Arctic, a prediction which seemed to be supported by the record low extent in 2012. When 2013 came along and the ice was still above the 2012 record, some predicted 2015 or 2016 instead. The well-known Arctic researcher Peter Wadhams stated in 2016 in his book Farewell to Ice that, having earlier expected to be gone by the mid-2010s, he now expected an ice-free summer Arctic by 2017 or 2018 – which again hasn’t happened. This repeated postponement has then been used by contrarians to wrongly claim that the wider climate science is flawed. Now, we are seeing 2022 being predicted as the next big year to be worried about for sea ice. But the observed trend is overlain by so much natural variability that predicting a specific year becomes a guessing game that may both prompt excessive alarm and undermine confidence in climate science. Based on what we’ve seen from both observations and the most recent IPCC report, an ice-free Arctic summer could happen within the next few decades under medium to high emissions scenarios, and very likely within this century, but the specific year will depend greatly on natural variability and how much more we emit in future. What of the second part of the claim we started with, that an ice-free Arctic – the so-called ‘blue ocean event’ mentioned at the beginning of this post – would have catastrophic regional and global climate impacts that risk runaway warming? Here the story has also been overhyped. Proponents of the ‘blue ocean event’ have proposed four elements for Arctic sea ice loss triggering a jump in temperatures, which has been estimated at 0.5–1.0oC, 0.6-0.9oC, or even 1.6oC above IPCC projections. The main proposed driver of this warming is the ice-albedo effect, meaning that an ice-free Arctic would absorb more heat (as the Arctic Ocean will be mostly blue, as referred to in the “Blue Ocean” name). This in itself true, but the magnitude of global warming because of this has been exaggerated by some. It has been claimed that sea ice loss in the Arctic is already significantly boosting global radiative forcing (RF; the actual energy imbalance caused by human emissions since AD1750 that drives global warming, measured in Watts per square metre of the Earth’s surface). Many claims mix and match different units and scales, so for accuracy and understanding below we’ve found the appropriate RF value and then estimate 21st century temperature impact using a transient climate response of +~2oC per doubling of CO2 (relevant over a few decades, versus a climate sensitivity of +~3oC per 2xCO2 for a timescale of centuries). For example, the current total change in RF due to human activity is +2.3 W/m², which translates to a near-term warming of 1.2oC. It’s been suggested that sea ice loss in the Arctic is already having the same effect as one quarter of all the CO2 released since 1979 as a result of the ice albedo effect. The source of this claim calculated that the increase in RF from melting sea ice is equivalent to 25% of the warming caused by CO2 alone from 1979-2011 (equivalent to an increase in RF of ~0.2 W/m², which would lead to ~0.11oC of warming). However, a reply paper has disputed this calculation on the basis that the original paper didn’t take into account counteracting negative feedbacks from Arctic clouds. Instead, global energy balance observations and RF estimates indicate that Arctic sea ice loss has so far had a smaller global impact (+RF ~0.1 W/m², equal to +~0.05oC) relative to current overall forcing. For a summer ice-free Arctic it has been claimed that temperatures would quickly go up by between 0.5oC and 1.0oC. 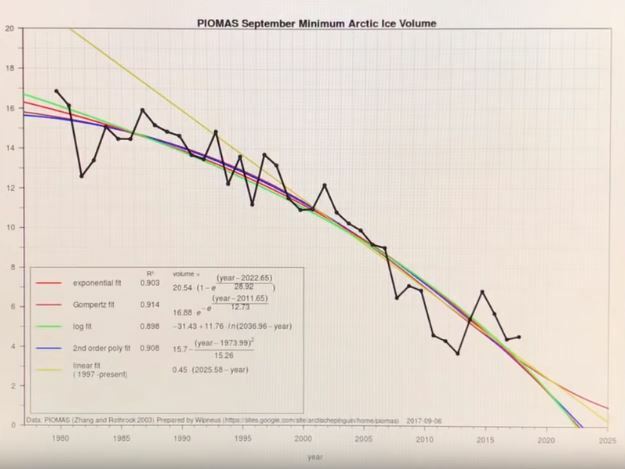 These claims are linked to comments made by Peter Wadhams in his book Farewell to Ice, where he says that a summer ice-free Arctic would increase radiative forcing by 50% of total historic carbon emissions. Given that the RF from CO2 emissions so far is +~1.6 W/m², this would represent an RF increase of +~0.8 W/m² (about +0.42oC in the near-term). However, estimates in scientific papers of the global RF increase for a summer ice-free Arctic are much more modest at around +0.3 W/m², which would lead to warming of about 0.16oC. Wadham’s estimate for summer ice-free Arctic is actually closer to the estimate for a year-round ice-free Arctic (+RF ~0.7 W/m², or about +~0.37oC). There’s also no evidence that the increase in radiative forcing from albedo would come as an abrupt jump rather than scaling up gradually with sea ice loss. This amplified Arctic warming could in turn affect the Northern Polar Jet Stream, a “river” of fast-moving wind high up in the troposphere (the bottom layer of Earth’s atmosphere) which dictates much of the Northern Hemisphere’s broader weather. A strong, stable jet stream relies on a large temperature difference between the equator and the pole. Now that the Arctic is warming up faster than the lower latitudes, that temperature difference is reducing and the jet stream is getting weaker. This may be making it easier for large air masses to ‘push’ the jet stream out of place, making it meander and sometimes split. This means warm air masses can end up farther north than usual and vice versa- recent cold and warm weather extremes in North America and Europe might be linked to the Jet Stream weakening. Reduced ASSI might also be affecting the North Atlantic Oscillation, a multi-year air pressure pattern affecting weather in Europe and North America. Another way that warming could lead to weather extremes in the mid-latitude Northern Hemisphere is the “polar vortex”. The stratospheric polar vortex is a region of air about 50 km high contained by another, polar, jet stream, known as the polar night jet (so-called as it only exists during the dark polar winter). When the stratospheric polar vortex weakens it can trigger a sudden stratospheric warming and allow cold Arctic air to move south. Although these happen naturally over the last 37 years they have become more common, and some have suggested low sea ice in key areas might help trigger them. If these links are significant, the fear is that these weather extremes could get worse in future and affect human health and crop yields in the Northern Hemisphere. But some proponents of the ‘blue ocean event’ scenario have recently argued that these weather extremes would have devastating impacts, with abrupt Arctic warming triggering the weakening or even loss of the Jet Stream, total crop failure, and societal collapse within 3 years. However, the science has not yet been definitively settled on the extent to which Arctic sea ice and northern hemisphere weather extremes might be linked, and it’s too early to tell how strong the trend in Arctic-driven weather extremes currently is or will become. Claims of a radical Jet Stream weakening also rely on huge temperature jumps when summer sea ice is lost, which as discussed above is unlikely to be so dramatic. The second proposed element of the ‘blue ocean event’ scenario is the ‘latent heat’ feedback. When heat (thermal energy) is applied to ice, the temperature of the ice increases. When the ice starts melting as energy continues to be applied, the ice’s temperature remains the same until it has converted to water. This energy that is absorbed to change the structure of the material rather than its temperature is called latent heat. Conversely, the freezing of water to ice releases heat. This means that the net melting of Arctic sea ice slightly reduces global warming (as measured in surface air temperature), as the melting ice absorbs a bit of the ocean or atmosphere’s heat instead. Conversely, once sea ice has disappeared this would mean that less heat is used by melting ice, so more heat might remain in the ocean or atmosphere instead. However, the proportion of anthropogenic heat that has gone into Arctic sea ice so far is only around a third of what has gone into the atmosphere (around 0.3oC of equivalent atmospheric warming), and tiny versus what’s gone into the ocean. Most discussions of the latent heat feedback, though, implicitly focus on the summer sea ice (sometimes interchanging it for all sea ice) and ignore that every winter the sea ice re-forms again, continuing the cycle of latent heat absorption and release even if summer sea ice reaches zero. This ice melt heat sink would only be entirely lost if all sea ice disappeared forever, but all of the trends we have been looking at are specifically for summer sea ice – no model or observations supports the total loss of winter sea ice this century, even after losing summer sea ice at some point. This means that although there will be an increase* in the rate of heat accumulation in the ocean and atmosphere due to sea ice decline, it will be very small compared to the overall global heat balance [*the exact rate is hard to predict, as heat budget measurements have mostly focused on the dominant ocean]. It’s also important to note that this latent heat is not hidden away in the sea ice and so will not suddenly be released and cause and abrupt atmospheric temperature rise once the ice melts – the heat was absorbed by the melting ice to change its state and is effectively permanently stored in the liquid water. On top of that, increasing evaporation from the warming oceans (including from the newly opened ice-free Arctic) also uses far more latent heat worldwide than just sea ice, further complicating how much latent heat fluxes will change both in the Arctic and globally in future. Overall, what we have with latent heat is: a globally-small heat sink getting smaller over time as the volume of sea ice melting each summer declines, relative to a far larger ocean heat sink and increases in the global latent heat flux due to evaporation from warmer waters. We do not have a sudden release of ‘hidden’ heat back into the atmosphere, as implied by the catastrophic ‘blue ocean event’ scenario. The final elements for the hypothesised catastrophic impacts of a ‘blue ocean event’ are the release of methane from both methane hydrates under the seabed and from permafrost on land. The issue of potential tipping points involving Arctic methane is a complex one which will get its own detailed post here soon (which will be linked here in due course). But as a brief summary, the evidence for imminent and dramatic release of methane from the Arctic is very limited, and a longer-term, non-catastrophic leakage of methane is far more likely. Further evidence for non-catastrophic impacts of an ice-free Arctic come from several thousand years ago in the early Holocene (shortly after the end of the last Ice Age glacial), a time of a relatively stable mild climate with no evidence of abrupt warming despite palaeo evidence of a period of relative warmth and ice-free summers in the Arctic Ocean. Finally, an Arctic sea ice tipping point doesn’t mean that the Arctic becoming ice-free will cause a sudden and dramatic global warming event. A common misconception with tipping points is that they’re always abrupt, dramatic events, when in reality their most important feature is their irreversibility even if they then only happen gradually. In this case, the tipping point is when losing summer sea ice would become inevitable through elevated regional warming even if human emissions ceased. By this definition, the latest IPCC report suggests that for a low emissions scenario there’s still a chance that some summer sea ice could survive, although continued emissions make this unlikely. Together, observations, theory, modelling, and palaeorecords suggest that a summer ice-free Arctic is not yet imminent, and will not trigger a globally catastrophic “Blue Ocean Event” when it does. The first ice-free summer in the Arctic will happen sooner than originally thought and likely sometime in the next few decades, but is hard to predict exactly when because of large natural variability on top of the human-driven warming trend. And while losing the summer sea ice will drive significant regional warming and and may increase mid-latitude weather extremes, the global warming boost will be modest (estimated at +~0.16oC) and won’t happen in one sudden jump. As with many climate tipping points, an ice-free Arctic won’t be the trigger for an abrupt, dramatic event. It is rather an unwelcome extra amplification of climate change that will have an impact over many decades. Climate tipping points will likely make climate change worse than expected and more difficult to counter, but claims of a near-inevitable chain reaction to runaway warming as a result of an ice-free Arctic are wide of the mark. Next Fact-Check: is “global dimming” shielding us from catastrophe?